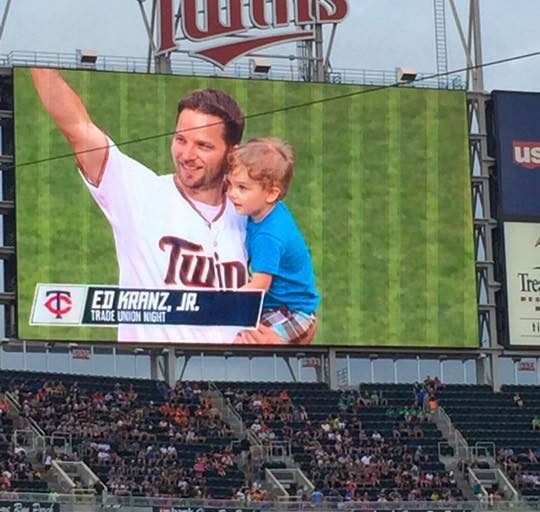 Twins Game First Pitch: Ed & EJ Honor "Naughty Grandpa" - Good. Plane. Living. Yup! 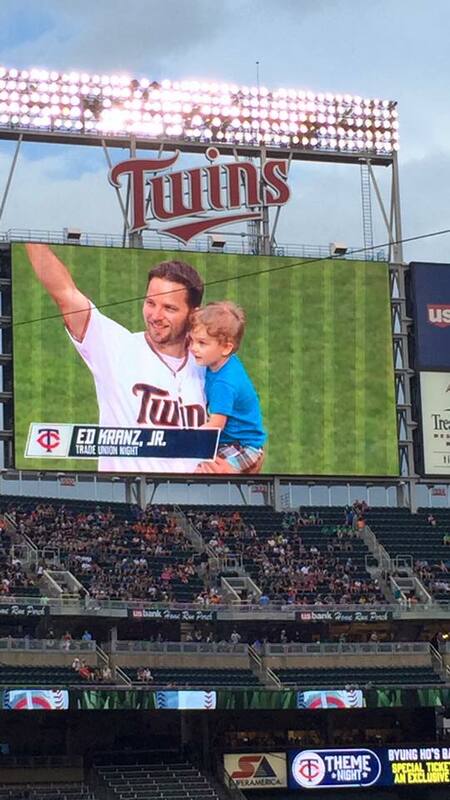 Ed and EJ threw out the first pitch at the Twins Game! 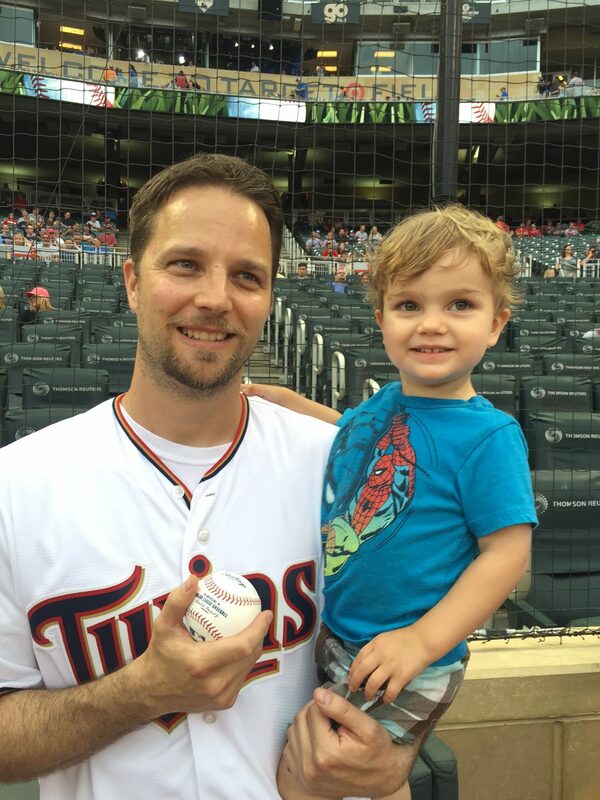 …but first know that to pull off first pitch with a toddler – we knew we had to figure out the best way for Ed to throw the ball 60 feet 6 inches while holding a wiggling ball of awesome. 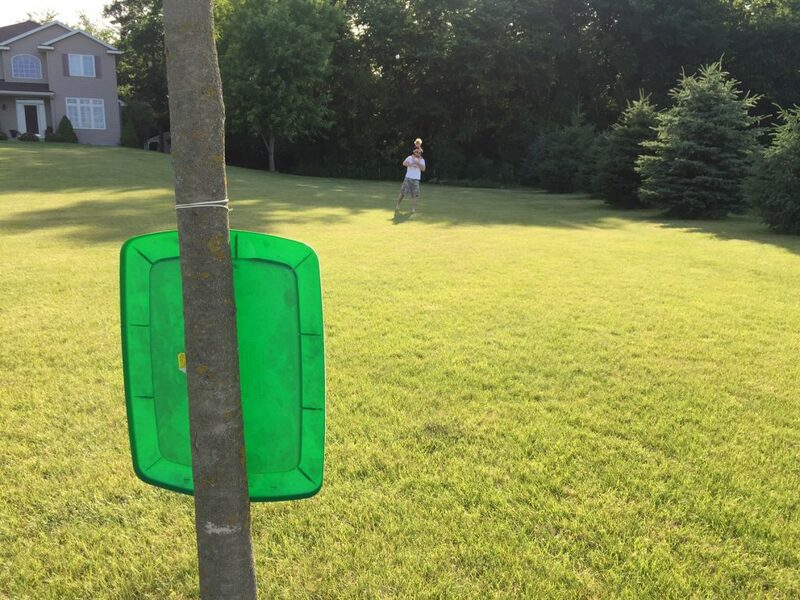 After a few practice throws hit our super expensive target, we thought Ed was prepared as he could be for the “big throw”. And it gave us a chance to prep EJ for the fun ahead! 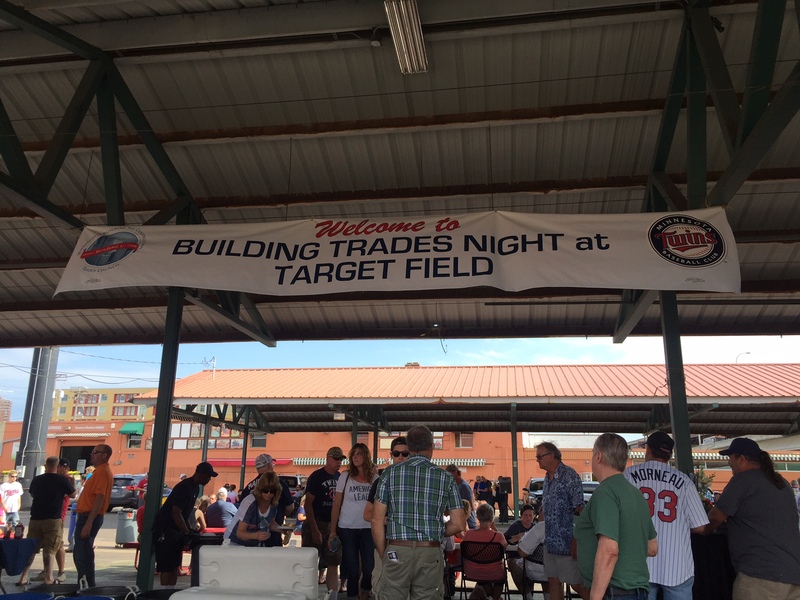 Wednesday night’s Twins Game was “Building Trades Night” recognizing the Building and Construction trades in the Twin Cites. Ed’s dad (also Ed Kranz, Big Ed, and self-named “Naughty Grandpa” to EJ) was a huge part of this annual event. In remembrance, and to honor Big Ed’s work with the Building Trades Unions, Ed and EJ were asked to throw out the first pitch. 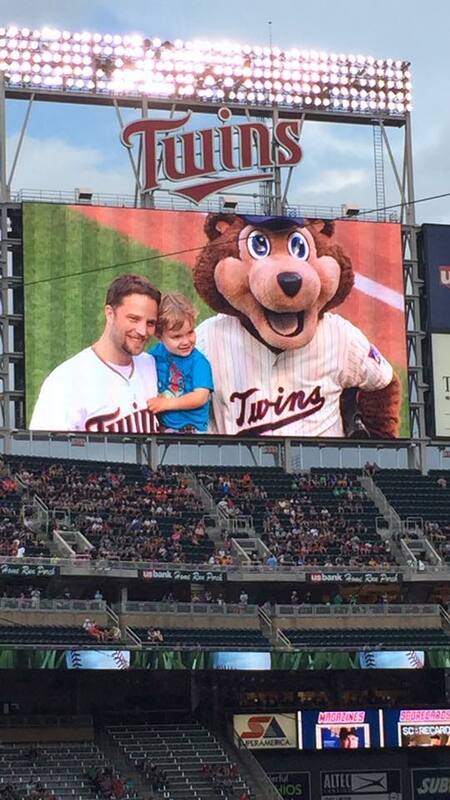 I know, sometimes it gets confusing with Big Ed, my Ed, little Ed (EJ)… bear with me, you’ll get it. 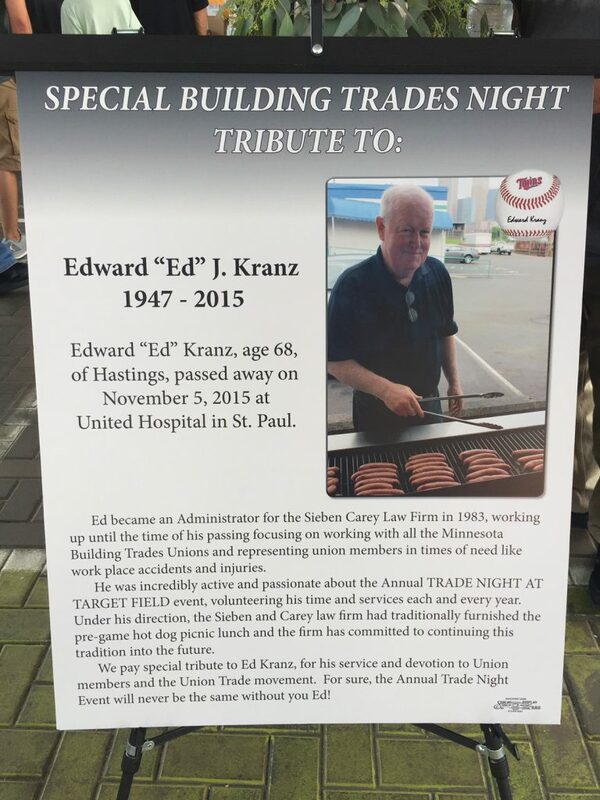 Edward “Ed” Kranz, age 68, of Hastings, passed away on November 5th, 2015 at United Hospital in St. Paul. 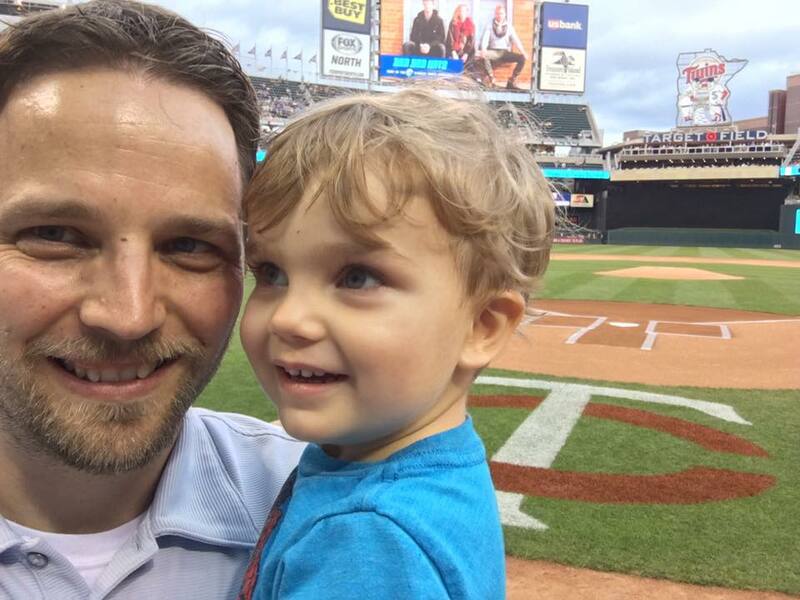 Ed became an Administrator for the Sieben Carey Law Firm in 1983, working up until the time of his passing focusing on the Minnesota Building Trades Unions and representing union members in times of need. 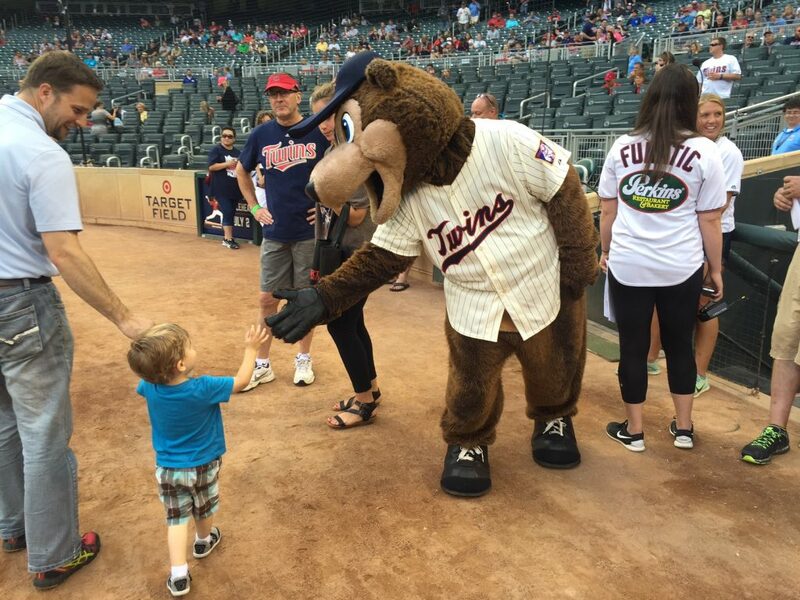 He was incredibly active and passionate about the Annual TRADE NIGHT AT TARGET FIELD event, volunteering his time and services each and every year. 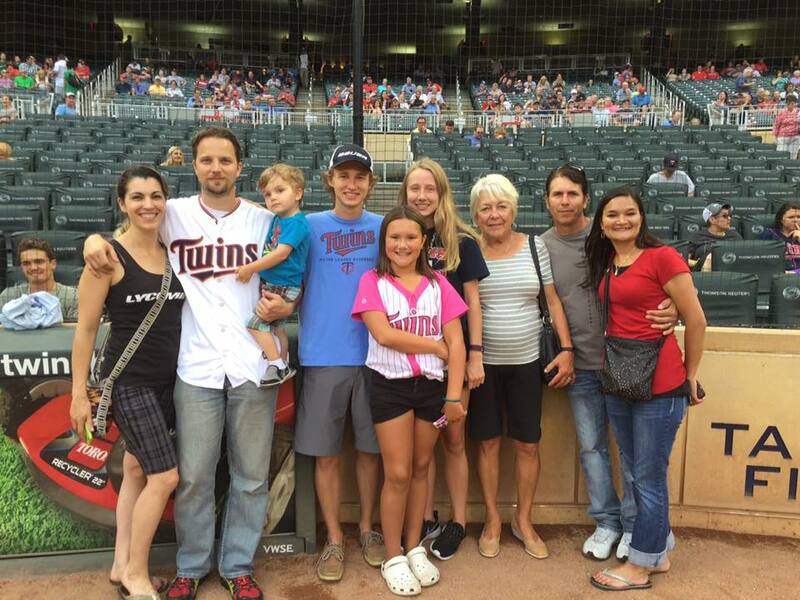 Under his direction, the Sieben and Carey law firm had traditionally furnished the pre-game hot dog picnic lunch and the firm has committed to continuing this tradition into the future. We pay special tribute to Ed Kranz, for his service and devotion to Union members and the Union Trade movement. 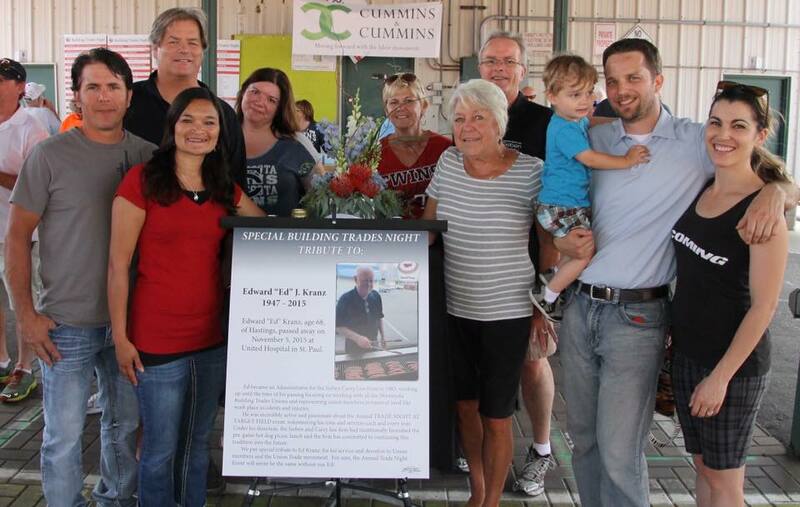 For sure, the Annual Trade Night Event will never be the same without you Ed! It was so special for our family to see the wonderful memorial and remembrance of Ed and get a bite of the famous hot dogs we remember him cooking year after year. 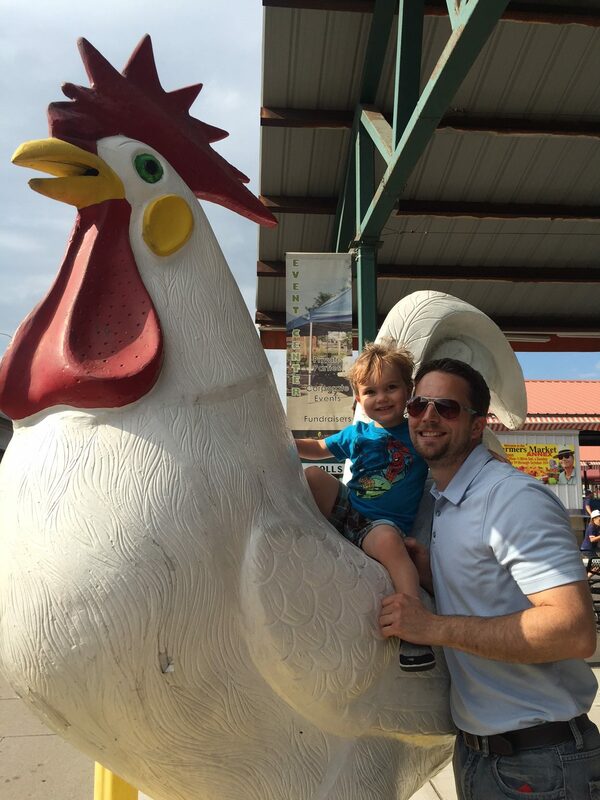 The picnic took place the the Minneapolis Farmers Market area and EJ especially love the BIG CHICKENS! 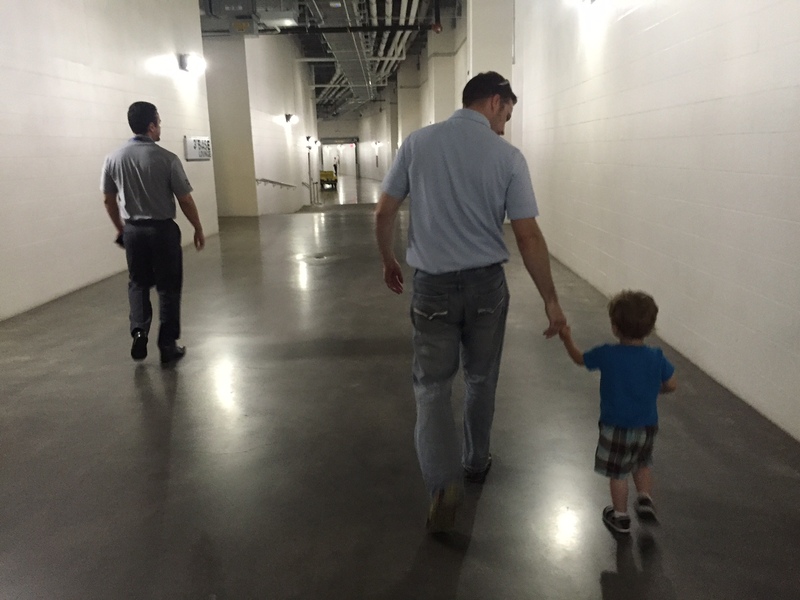 After the picnic, we headed over to Target Field and met with our special “handler” to lead us around the different waiting areas we needed to go. EJ had a hoot riding the escalators up and down! 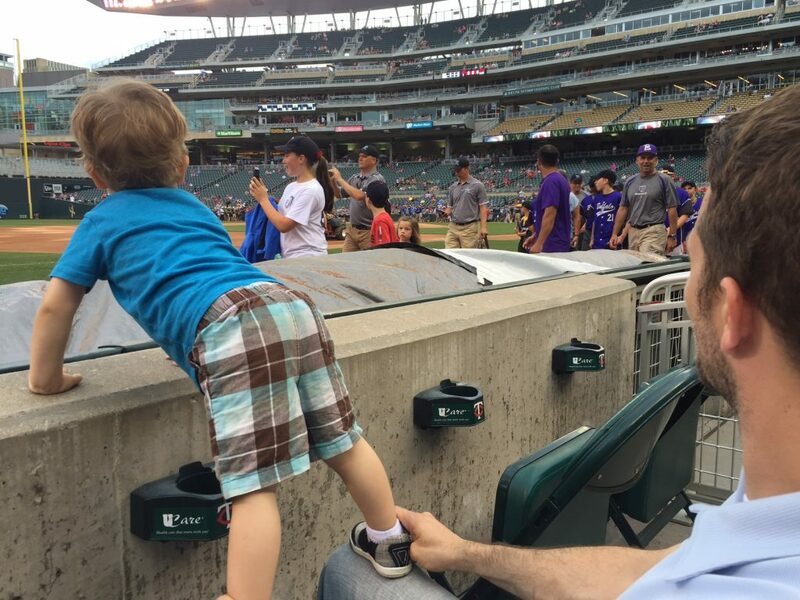 And a HIGH FIVE from T.C. Bear as we enter the field! And finally the big moment arrived, Ed and EJ walked out onto the pitcher’s mound. 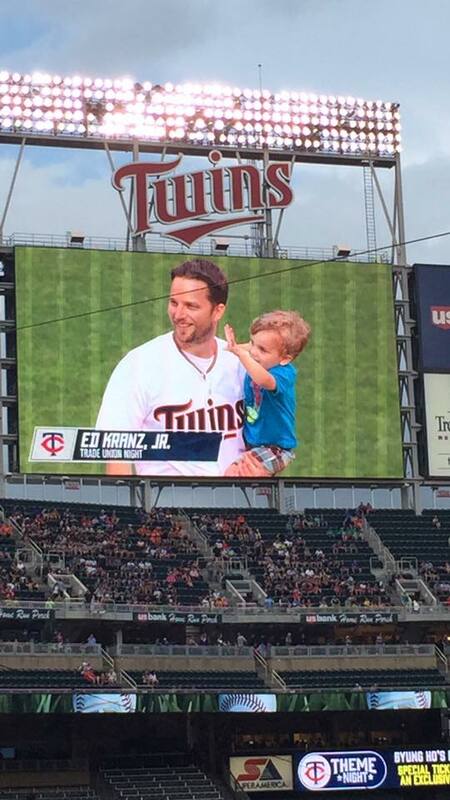 It was a pretty sweet moment =) And an amazing way to share, remember and honor Big Ed, Naughty Grandpa. 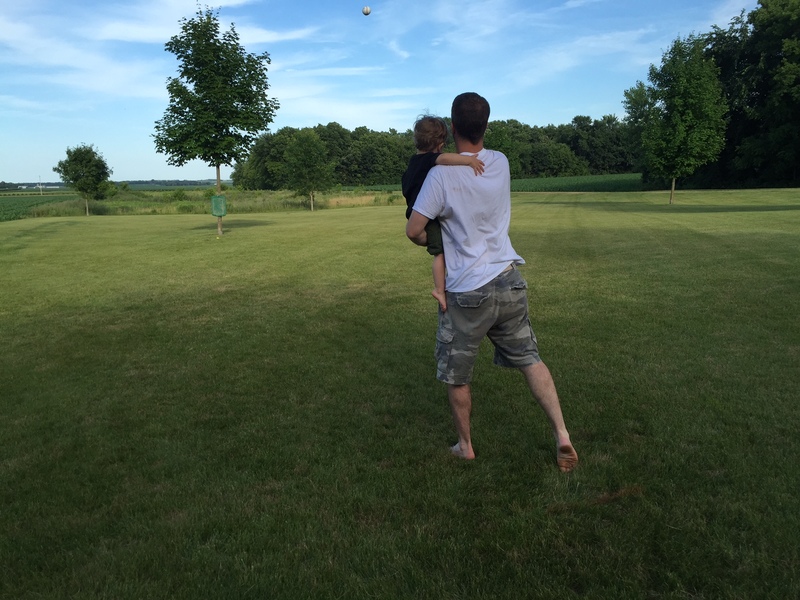 Pingback: Flight Report: Wisconsin Dells Fly In - Good. Plane. Living. Saw Niki a few weeks ago at the shop. 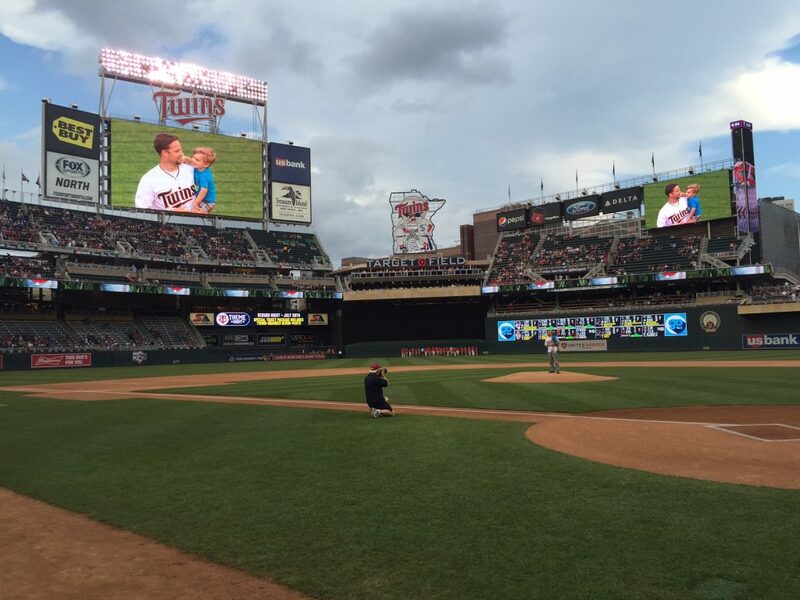 She mentioned that you guys (Ed & EJ) had thrown the first pitch at the Twins game in honor of Ed. So….Cool!!! !